Hot, hot here, at last (chez vous too perhaps? )–begs a cool cucumber response! Requested by Meredith a couple of days ago, this recipe features in Healthy Eating for Life–my new cookbook, out in January 2014. As I didn’t have a red onions to hand, I substituted spring onions (scallions). However the red onion lends a nice colour contrast. 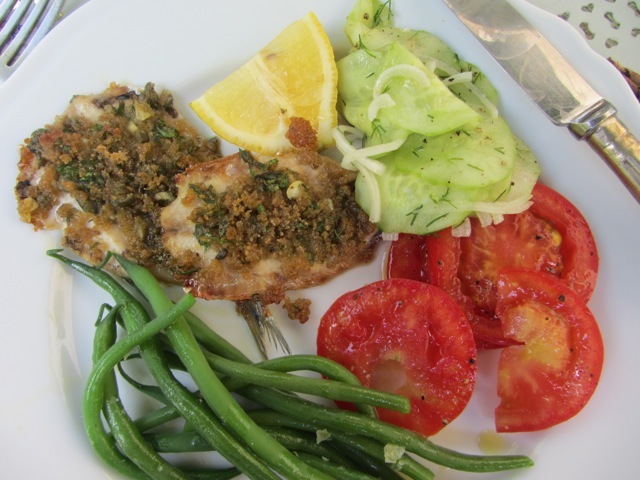 Served this with sardines–cuts nicely the rich, oiliness of the fish. 1 tbsp parsley or dill (dill is preferable but sometimes difficult to find). 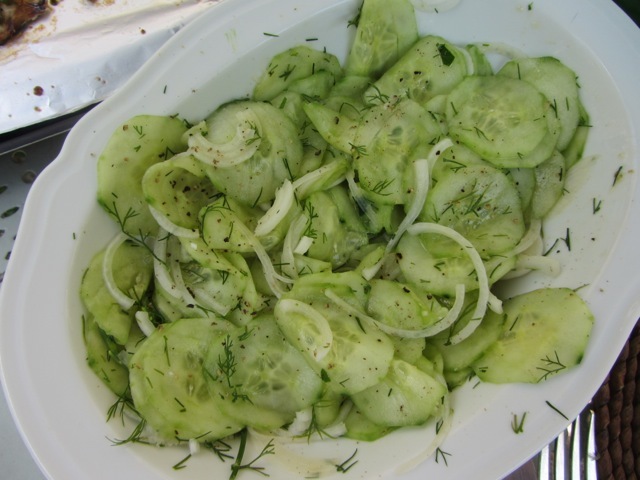 Combine the prepared cucumber and red onion and sprinkle with salt. Let the mix drain in a colander or sieve for 30 minutes or longer. Spread the mix over a layer of kitchen paper, cover with a second layer and press down gently to lift off excess liquid. Put it on a favourite serving plate or in a bowl. In another bowl, whisk together the vinegar and mustard; fold in the chopped herbs (dill or parsley). Pour this over the cucumber and onion and mix well. Leave this to luxuriate for an hour in the fridge. Great! Its even warm in the west of Scotland! Very good by trout & boiled potatoes. It was 35C here this weekend and I’ll do anything that looks cool – which this does. (It also looks easy — even better!) Oh, and even without trying this yet, I know dill is better. 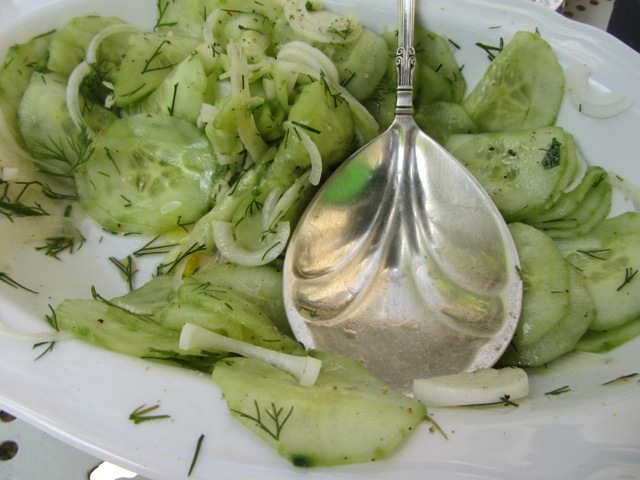 The Poles do something similar to this called mizeria and the dill really makes the dish. You’re right Chris–if you can find it dill’s the thing. it is 101 here in Mississippi, USA. will be pickling up some cucumbers today. thanks for the new recipe. Slice cucs very thin and salt heavily. Leave in bowl for 3 hours. Drain and squeeze BY HAND several times. . .this is the trick, and doesn’t destroy the cucs!! Add onion, oil, vinegar, a little sugar, salt and pepper, and a tad of mayo to taste if you want. Let stand in fridge for an hour. Your addition of herbs is great, and I seem to recall that she would use dill if she had it, though I cannot verify that since Grahmah and my mom have been long gone, and this recipe is truly handed down word of mouth, or by simply remembering watching their genius at work! Hot and Humid in Connecticut! I like the “hands on” approach of your grandmother–I shall try it. Hot here in Central Arizona, too. Waiting for the monsoons to begin. I think I will use organic English cucumbers, which I do not peel. Very pretty. Thanks for the recipe! Another thing I do in summer is sort of a fruit “soup.” I mix fresh fruits, canned pineapple (with no sugar) and the juices, and sliced cucumber. Very refreshing! Looks yummy, can’t wait to try it! Simple and refreshing, lots of enzymes. Gives me a good idea of why I would want to buy those cucumbers I saw at a local farm market. I just happen to have dill in my garden (which was planted for the butterflies) and now I have a way to use it. I used my cukes from the garden – this was divine! No dill, so substituted my fresh chives instead, still delicious.